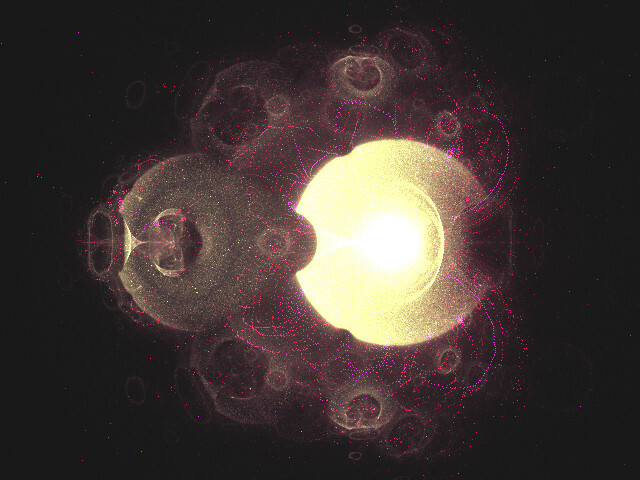 I was trying to implement Buddhabrot in Ultra Fractal. Objectives were: 1 - to have more control over colours than in free buddhabrot renderers, 2 - to have more colour effects than UF single channel colour buddhabrots using gradient, 3 - to have more formulas to play width, 4 - to have something new, 5 - smoothness and 6 - speed. Mostly I just used code from Susan D. Chambless Buddhabrot IV, becouse it is working, throught only 1 channel. Buddhabrot sample density is limited to 31690. If I use larger sample density, say 31691, it simply ceases to render and on screen shows colour of zero index. Is this becouse of some Ultra Fractal limitations of arrays or becouse of not enought memory? Second problem is zoom, when zooming in by just few clicks it allways looses density to almoust zero. This can be owercomed by much higher sample density, but then it becomes extremely slow. Maybe something must be done with source pixels? Third, random number generator is not enought random. Throught it can have cool spiral orbits, but with same seed it don't looks random at all. Maybe Buddhabrot naturaly would go with classes. Throught not all formulas goes with buddhabrot, and not all formulas with buddhabrot have interesting mandelbrot set and probably without .ulb it is faster and classes aren't very user friendly. ;code mostly taken from Susan D. Chambless buddhabrot. int locindex = 2 ;for background contrast starts with 1.
;now formula will go throught pixels. ; switching red and blue. ;colour mode: direct, using palette, or mixed. ; colour mode like of Fractal Explorer. ; uses pallete, but each chanell is calculated seperately. hint="The larger value, the more points hits image, the more detailed will be image." hint = "Shows how rendering is progressing. So you can see, that it is working or not." ;hint="This don't requires large bailout, cos points with large value will be outside of image." 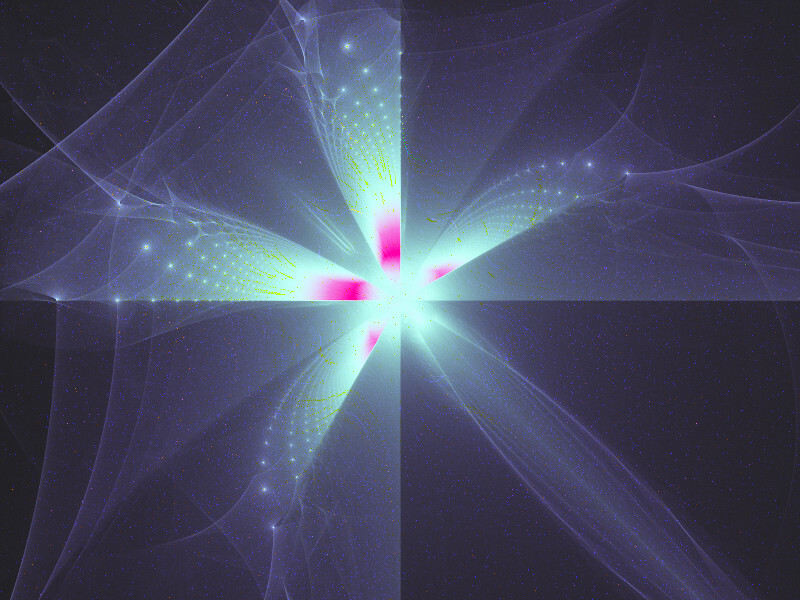 hint = "Maxiter for fractal. Long orbits will stay in certain alredy dense region." 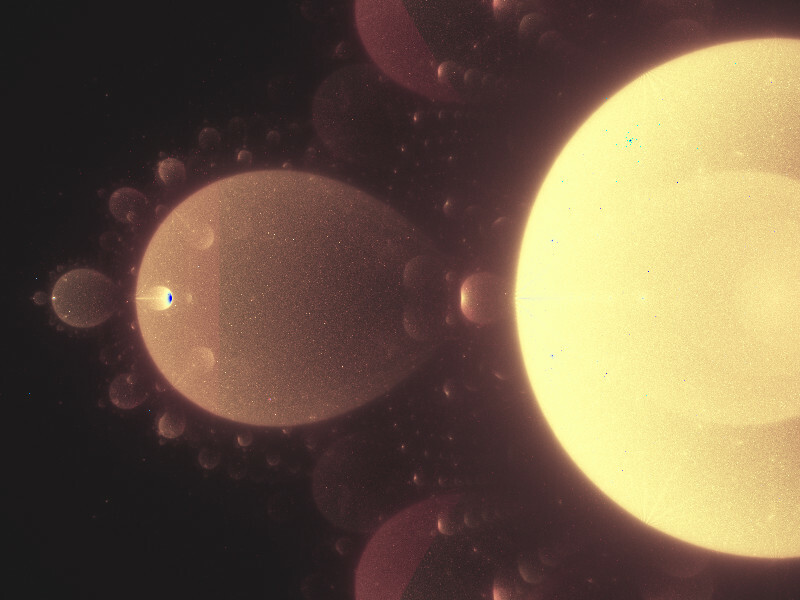 caption = "Pixel input Block"
caption = "Pixel source Width"
caption = "Pixel source Height"
enum= "Mandelbrot" "Talis" "Starbrot" "Tricorn" "Bird Of Prey" "8th modulus Mbrot" "Unit Vector - Mbrot" "Quadratic General" "Celtic Mandelbrot" "Rotated Mandelbrot" "Trotsky Dragon" "Multipowerbrot Odd"
enum= "Direct Colouring" "Gradient Based" "Mixed Harmonic" "Fractal Explorer like" "Gradient by Harmonic"
hint= "Gradient Based is gradient calculated from green channel, gradient harmonic is gradient calc from mean of all channels. Mixed is harmonic mean between gradient colour (by mean of RGB) and RGB channels. Fractal Explorer like is RGB values calculated seperately from gradient. All exept direct colouring uses gradient and alpha channel." caption = "Switch Red and Blue"
hint= "Switch Red and Blue channels." hint="Starts colour calculation with this value + 1/ iteration. Density of colour wave depends on this, lowest is somewhere -2.5." hint="Removes unnatural blue tint of non-gradient methods." Throught this still ave mentioned problems and don't have quality I wanted. I would like to have any suggestions of whatever kind. the more iterations you use the more clearer the final image becomes! Main problem with UF buddhabrot version is that it is implemented in sneakish way in iterations done in global section, so it just can't be rendered in a flow as in dedicated soft. So far all other UF buddhabrots are map based, its easy to make but don't looks cosmic as original ones. Mostly spent time on coding and then made some fast renders. Now this slightly faster and with more RGB colour channel switches, one more colour transform and more formula variables, throught zooming still are so so. Red dots on mandelbrot picture should be some some notable orbits. Position of red dots depends on Random Seed, and with the same random seed spirals allways are in the same places. 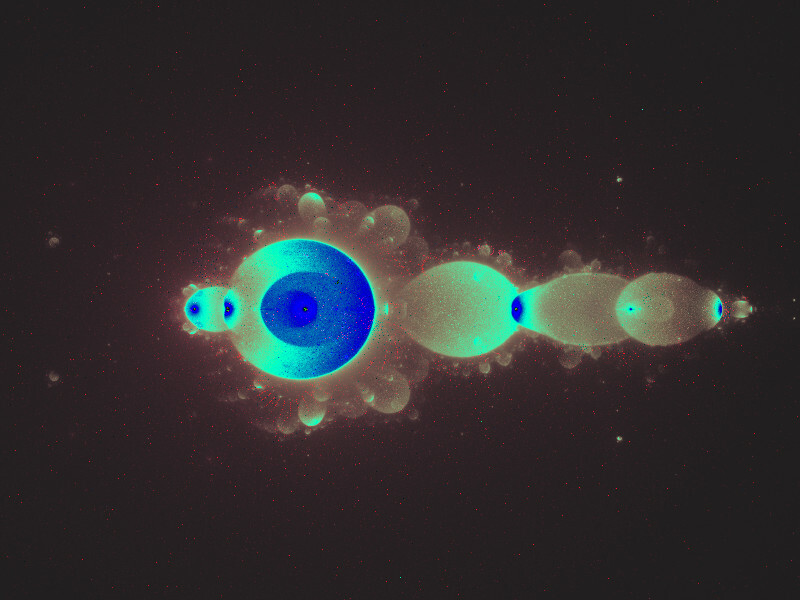 Here are two mandelbrots with different random seed and mandelbrot with 8th power modulus. 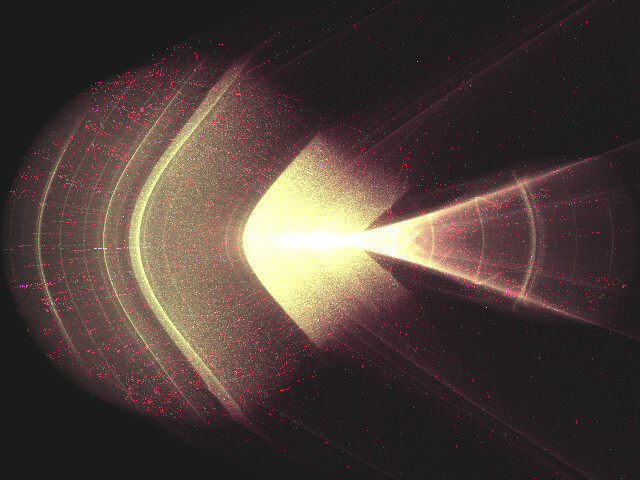 AntiBuddhabrot seems to be stronger than Buddhabrot becouse escping orbits escapes pretty fast, but non escaping iterates much longer thus generating more antibuddhabrot (non escaping only) like picture. But here mixed version goes pretty well. My monitor seems to be a bitt dark;) Well, any comments about this are strongly welcomed cos I alone with just my opinion won't manage make this good. I alsou was thinking, that having object formula switch in buddhabrot would be pretty good feature. There are formula switch, but object database is 100 times larger. Throught some object using formulas are nightmare from usability point of wiev, and some formulas with buddhabrot turns out extremely slow. And this was alsou intended that it would work in Chaos Pro. So I was thinking about uplooading to UF database two versions, one using object formula switch and another with usual user easy switch. haha, wow, it's a bomb, a fat star and a fat BBrot. Much improved version. + Now this allows much larger sample size * screen resolution. (sample size * screen resolution can exeed integer number upper limit). (800*600)*5000=2 400 000 000 when largest possible integer is +2 147 483 647. + Better zooming as it woun't loose so much density by puting hits on pixels outside of screen. + More formulas and colour switches. (some from Fractint Ogfrom, alsou Perpendicular Mandelbrot, and looking in mmf and slightly modifying some formulas found that z=formula*iterations*0.05+c can create cool cosmic deities. + Removed excess internal variables. + You can put lucky number and see, how different random seeds picks different orbits. Standart random numbers aren't too much random, but this nonrandomness allows to show specific orbits, and with same seed they always 'll be the same orbits. Still haven't managed to implement class switch, becouse it needs formula(z, c) which don't use #pixel variable. Standart class switch uses formula(z) with #pixel inside of pluggin class. But buddhabrot is calculated in global section before programm reads #pixel. Any tips? But I think, now this in enought good condition to be finalised, just need to write some explanations. This is slightly different from buddhabrot and antibuddhabrot algorithms that it don't divides escaping and non escaping points, so it is both a buddhabrot and antibudhabrot, anyway, most interesting are region in between and so it needs fewer samples to create final shape what is pretty handy if you are dependent on outside aplication and don't want to look on clock too much. Alsou this do not reiterate formula. And colours here are calculated differently than of standart nebulabrot with 3 iteration numbers, colours still depends on how much times pixel is hit by orbit, but colours are calculated as smooth growing curve so that RGB have different curves. Probably last thing pronounces first notable orbits. ; using Wave Trichrome method, who actualy are inspired by RGB Buddhabrots and needs fewer iterations. ; As it don't tests for insdes or outsides of fractal, but mixes buddhabrot and antibuddhabrot. ; source code for this mostly is taken from Susan D. Chambless buddhabrot. ; and one more loop. ; Initialize arrays of RGB pixels with neutral colour. ;loop in many small. 12 divides better than 10.
locindex = 1 ;for background contrast starts with 1.
;set main loop to 0 and go throught next cycle. 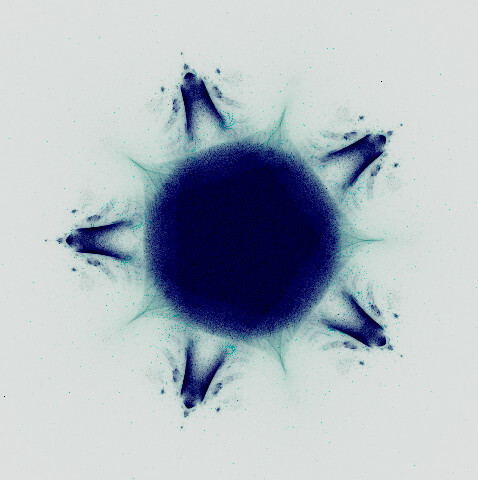 ;now formula will go throught pixels by fractal generator. caption = "Use with Pixel aka No Formula." hint="Main variable. The larger value, the more points hits image, the more detailed will be image. Put relatively small value for fast first calculation, then increase for smooth pic." ;hint = "Shows how rendering is progressing. So you can see, that it is working or not." 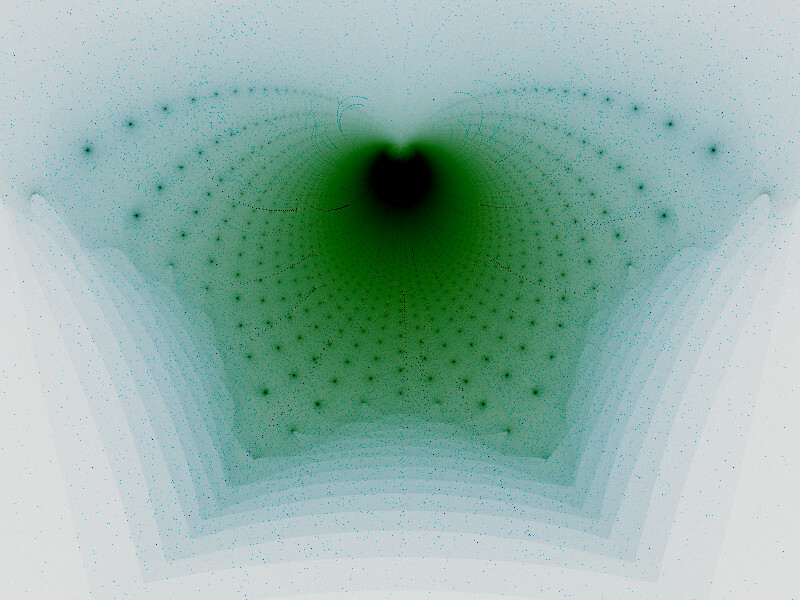 hint = "Maxiter for fractal. Long orbits will stay in certain alredy dense region, but small maxiter will make this too blury." hint="Random seed used to calculate random numbers who realy aren't that random. Different seeds marks different firstfound orbits." enum= "Mandelbrot" "Talis" "Starbrot" "Tricorn" "BurningSihp" "8th modulus Mbrot" "Unit Vector - Mbrot" "Quadratic General" "Celtic Mandelbrot" "Rotated Mandelbrot" "ChebyshevAxolotl" "Mbrot*iters" "Talis+iters" "Tricorn*iters" "BurningShip*iters" "QuadGen*iters" "Trotsky Dragon" "Multipowerbrot Odd" "Magnetic" "ChebyshevT4" "PerpendicularMbrot"
hint= "Fractal formula used for calculation. Mbrot here stands fro Mandelbrot." hint="2 is very celtic and 2 is very cosmic." hint="Scaling here works as zooming in or out." enum ="None" "Switch Red and Green" "Switch Red and Blue" "Switch Green and Blue"
hint= "Switch colour channels to change image tones, so that don't need to change light and scalar of RGB." hint="Greyscale colour value of uniterated pixel. Result then is added / substracted from this." enum = "0- None" "1- Sin (periodic)" "2- Inverted" "3- Square Power (sharper)" "4- Cos (Inv periodic)" "5- Accentuate RGB" "6- Solarisation (periodic)" "7- Hyperbolic Tangent" "8- SineCosineMix (periodic)" "9- Haversine (periodic)"
hint="The same as UF, but applied before colour mode, and works with direct colour. Periodic will colour white regions." If there are someone who are making another Buddhabrot aplication, I think, this could have some ideas what to do. you get quite some nice results. What you do seems sort of similar to most of my works. 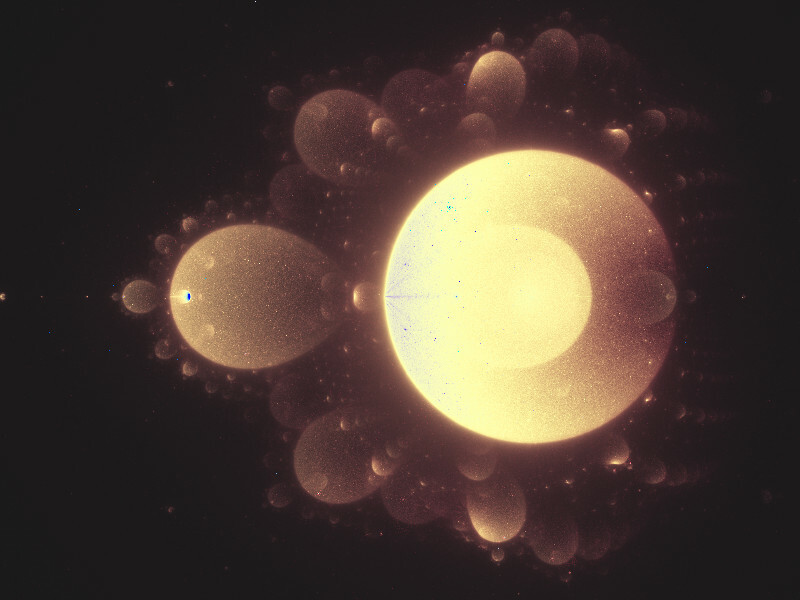 Except for the first, oldest one in this set (which was made in Blender and Indigo, although it's such a simple scene, you could probably write it into an indigo xml format by hand), all of them are some sort of Buddhabrot fractal. For a while I used random polynomials of fifth order. Those turned out to be pretty nice. 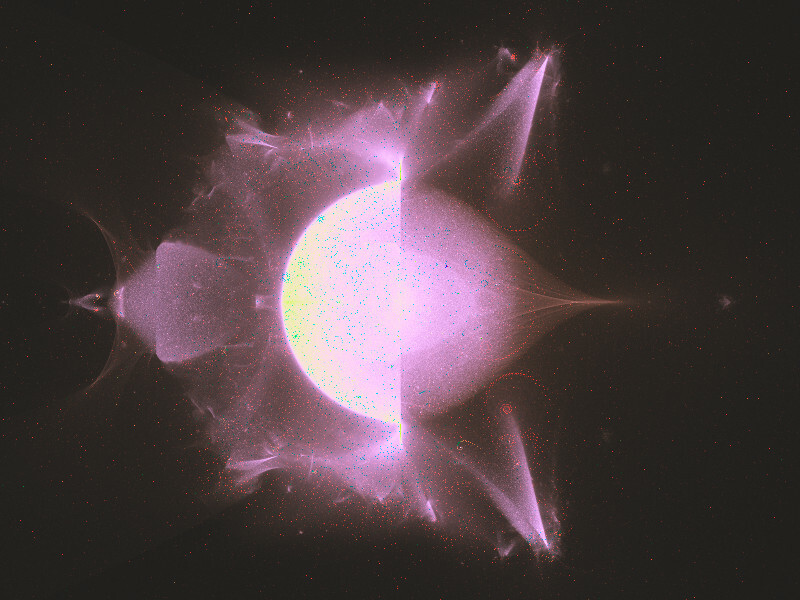 I enjoy fiddling with Fractint and using its rather simple orbit display method of rendering images to come up with Buddhabrot-style animations. Although I must say that I'm completely baffled by what video file settings might be needed to come up with something that looks good on either Vimeo or YouTube - the shaded, wispy colours are usually butchered by the compression routines used by these two sites. I can come up with something that looks fairly clean with Sony Vegas (images are rendered, processed and uploaded at 1280x720), but most of the Buddhabrot-style animations range from mediocre to dreadful when viewed online. Oh well. Nonetheless, here are a couple of my favourite orbit cloud animations. The first is a Barnsley Julia, the second one of Fractint's invented generalized function fractals using the old buggy cosxx routine. Still haven't managed to implement class switch, becouse it needs formula(z, c) which don't use #pixel variable. Standart class switch uses formula(z) with #pixel inside of pluggin class. But buddhabrot is calculated in global section before programm reads #pixel. Any tips? Whose Class Switch are you using? Mine and Dave Makin's are substantially different. Standart. Your seems simmilar. Maybe David Makin's could work becouse they uses different switches and bailouts so probably don't have #pixel inside. Changed coeffs, so that colours are less bright + sine transform to turn whites back to colours + more sampling. Lines should be of not enought area of pixel sampling. z*tan(z)+c render is nice one. I tested the same formula, but got something different, probably cos of small bailout or something.